A 50-pound cyst has been removed from an ovary of a woman whose stomach was so large that her doctor told her to go on a diet, and strangers asked if she was expecting twins. Kayla Rahn of Montgomery, Alabama, has spoken out about her ordeal after suffering months of unexplained stomach issues, pain and weight gain. 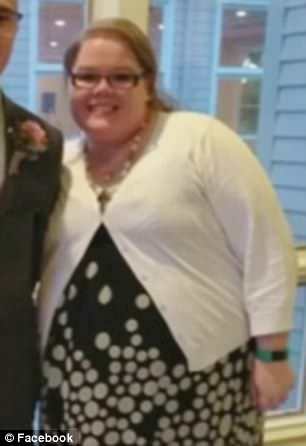 The 30-year-old said that persistent stomach problems last year impacted day-to-day activities: ‘I couldn’t walk to my car without losing my breath.’ However, medical professionals simply advised her to ‘lose weight’. 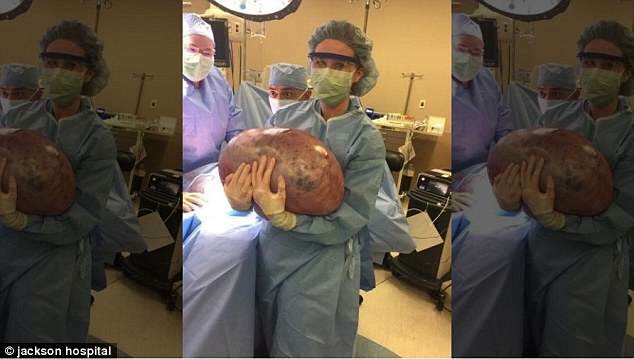 She underwent an operation to remove the huge mass – a 50 pound cyst – from one of her ovaries. The mass was the equivalent of being pregnant with six babies – the average birth weight in the United States is about 7.5 lbs. Dr Gregory Jones, obstetrics and gynecology, was among the medical team undertaking the surgical procedure. He said the cyst, a mucinous cystadenoma, was benign, and added: ‘This is one of the largest that I have ever seen, or certainly removed. [The operation] went well for her.’ A happy – and relieved-looking – Rahn said she hoped her story would encourage others to listen to their bodies.